Box Tops for Education is a year-round fundraising effort at Poly Drive. We encourage you to both clip box tops and use the bonus Box Tops app to maximize funds received. The first collection due date is next Wed., Oct. 25. Please turn in collected, clipped box tops to your students’ classroom, and also enter any receipts into the Box Tops app, by the collection due date. So far, $24.60 of the $1,000 year goal has been received. So help raise funds for initiatives like Reflections Art Program, Spanish Club, STEAM Club, Math Club and much more! Just clip your way to cash for the benefit of our Poly Drive Polar Bears. Poly Drive will celebrate International Walk to School Day with our Annual Walk and Bike to School-A-Thon and Walking School Bus! For those who are new to the concept, a walking school bus is a group of students walking to school as a group, under the watch of adults/parents and older students. Younger students are encouraged to “board” the bus at any point along its route to school. The Poly Drive Walking School Bus will operate in the morning only, Monday, Oct. 2 through Friday, Oct. 6, beginning at the northwest corner of Poly & Hoover at approximately 7:55am. The route will proceed toward campus on the north side of Poly Drive. Another Walking School Bus route has been started this year, with a cohort meeting at Colton and Rehburg, and another at the corner of Rimrock and Rehburg, both at 7:50. They will meet up at Poly and Rehburg at 7:55, and proceed to the campus along Poly. Log sheets were sent home in last week’s Wednesday Watch. Students tally their miles, as well as parent miles, and top mileage logs will win prizes. Questions may be directed to Lyndsay Serpe at lcross4@hotmail.com. March Madness mixed old favorites and new features. Initial figures from the Mar. 31 event indicate about $500 raised from the Dino-ize Croff effort. And dessert enthusiasts paid about $1,500 at the new Decadent Dessert Auction. 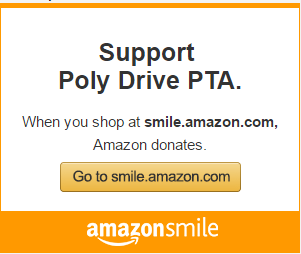 After expenses, $8,593 was raised to benefit the PTA STEM fund at Poly Drive. A highlight of the evening was Principal’s Croff stint as a T-Rex. He marched through the hallways in the inflatable suit, as students reached their fundraising goal.